Welcome to the QE Park Community Centre website. 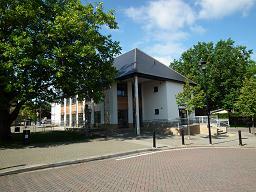 The QE Park Centre is owned and managed by New Life Baptist Church, and serves the area of Stoughton and Queen Elizabeth Park in north Guildford. The Centre offers excellent facilities for many different groups, birthday parties, conferences and public meetings. It includes good audio/visual equipment and a 'commercial' kitchen. The church opened a community café in April 2016, called Refresh. This was supported in part by a grant from Guildford Borough Council of £15,000. To provide a safe, happy, respected and child-sensitive Community Centre for the area around Stoughton that is open to all. To help foster good neighbourly relations. To enhance the local community with a building and attractive facilities that everyone can be proud of.